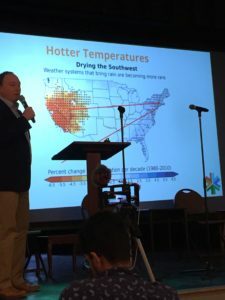 On March 10, 2019, I gave a presentation on spiritual sustenance at “Climate Change, Extreme Weather and Vulnerability: An Interfaith Summit on How to Respond.” Organized by CREW (Communities Responding to Extreme Weather), the event brought together faith leaders, policy makers, public health officials, climate activists, community organizers, and other stakeholders to discuss how climate resilience connects with racial and economic justice, and how faith communities (and other groups) can become “climate resilience hubs.” The summit was held at Old South Church in Boston. My remarks are below. I’d like to reflect on the spiritual resources and perspectives that give us strength as we answer the call to stabilize the climate and re-weave the web of life. In order to be healers and justice-makers, we need to be emotionally and spiritually resilient. We need to take care of our inner lives. In this time of unprecedented challenge, what will we do with our feelings of fear, helplessness, and despair? Where will we find the energy and hope to keep working toward solutions without panicking or giving up? What spiritual vision and spiritual practices can sustain us so that we don’t lose heart? 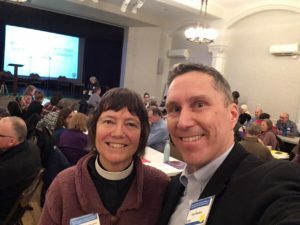 I find this issue so compelling that I just finished co-editing a book with my friend Leah Schade that will be published this fall: Rooted and Rising: Voices of Courage in a Time of Climate Crisis (Rowman & Littlefield, 2019). It is a collection of essays by twenty-one faith-rooted climate activists, reflecting on these very questions. Today I would like to offer a three-part framework for the heart, a way of “holding” the climate crisis in a way that helps us to respond wisely and creatively to the challenges we face. After these brief remarks, I’ll invite you to talk to each other about what they evoke in you. I speak as a Christian, yet I hope that this simple framework will be intelligible and even useful, whatever your tradition. I’m going to sketch a spiritual journey in which we cultivate an awakened heart, a broken heart, and a radiant heart. We begin with an awakened heart. What is an awakened heart? It is a heart that is more and more deeply, more and more frequently, more and more consciously attuned to love. A person with an awakened heart is someone whose heart is repeatedly touched by a boundless love that seems to well up from nowhere or that unexpectedly shines out in the world around. A person with an awakened heart is someone who is learning to see herself, and others, and all Creation, with eyes of love. This is when we perceive the beauty and preciousness of God’s Creation. We experience gratefulness, wonder, amazement, awe. We discover how cherished we are as creatures that are part of creation. That’s an awakened heart! God is always luring us to wake up and fall in love. Experiencing our God-given preciousness is a powerful antidote to the voices that deride human beings as “a cancer on the planet,” a “virus” taking down life. I understand the anger in such statements, which is triggered by knowing the awful damage that human beings are doing to the eco-systems on which all life depends. And – yes – our ever-expanding industrial economy, based on fossil fuels, is indeed acting like a cancer that takes down life. But the only way forward is not to feed the voice of self-hatred, but instead to listen to the voice of love that is always sounding in our hearts and that alone can help us to imagine new possibilities, turn us around, and guide us on a different path. As I see it, all the world’s religious practices, from mindfulness meditation to keeping Sabbath and practicing gratitude, are disciplines that help our hearts awaken. As we walk forward with awakened hearts we experience a broken heart. Of course none of us wants to move into this second stage of the journey, and there are many reasons we fear and repress our grief. As Joanna Macy, the Buddhist activist and teacher points out, we don’t want to feel pain; we don’t want to look morbid; we don’t want to bring other people down; we don’t want to seem weak and emotional. And yet we do feel pain for the world. We can’t help it. No one is exempt from it, because we’re part of the whole, and the suffering that goes on in one place ripples out across the planet. As you consider the suffering caused by climate change, where do you feel the grief? What are the tears you need to shed? What is breaking your heart? And how do you and I open to the pain of our precious world without drowning in the pain? The divine love in which we participate doesn’t wall itself off from suffering, but enters it, shares it, and touches it with love. For Christians, the symbol of that divine sharing in our suffering is the cross of Christ. So, as a Christian, I go in prayer to the cross, where I believe that everything in us – our pain and anger, our grief, our guilt – is perpetually met by the mercy and love of God. 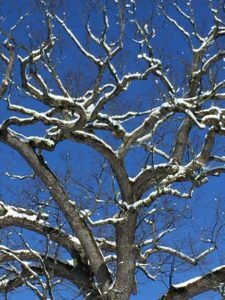 One way or another, all the world’s spiritual traditions teach that there is no escape from suffering and that, paradoxically, a broken heart can be the gateway to hope and even joy. Now comes the third part of this spiritual framework. Filled with love, because day by day our heart is awakened, and feeling our suffering and the suffering of the world, because we allow our hearts to break open, we want the love that is flowing into our lives to pour out into the world around us. We’ve been cultivating an awakened heart, we’re accepting a broken heart, and now we want to express what I’m calling a radiant heart. We want our lives to bear witness in tangible ways to the love that has set us free. What we feel sent out to do can take many forms. Commitment to care for the Earth will affect what we buy, what we drive and how much we drive, how we heat our homes, what we eat, how much we re-use and re-cycle, how we vote, how we invest our money (if we have money to invest), and how eagerly we join with other people to push for the enormous systemic changes that are required if we’re going to leave a world to our children that is worth living in. When we know that we’re cherished to the core, and when our anguish is met again and again by the ever-merciful love of God, then our actions are more likely to spring from wisdom than from fear or compulsion, and we live with a new sense of spaciousness and freedom, unattached to results. There is nothing more joyful than to find a great purpose in life, or, rather, to let a great purpose find you. When we find something big enough to live for, something perhaps big enough to die for, we tap into a wellspring of joy. What greater purpose could you and I share than the great work of creating a just and livable world for our children and for generations yet unborn? I give thanks for the ways that you manifest an awakened, broken, and radiant heart. This is a wonderful moment to be alive. Which of these three places in the heart most needs your attention? How are you cultivating an awakened heart – what is helping you to grow in love? How are you accepting a broken heart – how do you work with your feelings of fear, outrage, or grief? How are you manifesting a radiant heart – how are you involved in acts of healing or justice? St. Francis of Assisi, “Wring Out My Clothes,” in Love Poems from God: Twelve Sacred Voices from the East and West, translated by Daniel Ladinsky, New York, Penguin Compass, 2002, 48. Perhaps one of the unique contributions of a faith based approach to Earth Care is an underlying and undying hope. These stages of progress build on that. It is hard to remain hopeful so often. Thanks for your comment, Barry. Yes, we do need to wrestle with our anger and grief and fear. Sometimes our hope springs from our outer circumstances — I live in hope that the Green New Deal will launch a powerful, united movement to address the climate crisis and economic inequity — but more often I live in a hope that comes from within: my hope in a God who loves us utterly and whose Spirit is always speaking in our hearts, urging us to change course when we are hurtling toward ecocide and suicide. I pray that we will listen to God’s voice. I am so grateful to have found your web site and to have read this teaching. These teachings are universal, they express the depth and profundity of the human heart. In the buddhist tradition, we also speak of an awakened heart, the heart of tenderness that opens to others and the world with warmth and caring, or we could say simply, love. That heart is vast, so vast it can hold both the loving-kindness towards all beings and the compassion that sees their suffering. My teacher taught that if you can hold these two things in your heart, you can do things properly – not falling into any extreme, and with clarity about what will be most beneficial. I have always liked a Jewish saying – There is nothing so whole as a broken heart. This has been my reminder to stay open even when hurt or witnessing hurt. I can’t help but feel that the resilient heart is a combination of joy and clarity or perhaps what in the buddhist tradition we call compassion together with the skillful means to know what to do. I appreciate how you have taken these three steps of opening the heart as a path. Wonderful. Thank you. Thank you so much for this very insightful reflection. It seems to me that our task is to learn how to be fully human — awake, responsive, compassionate, wise. Your words ring with truth. Thank you for writing!